Welcome back to X-Wing™ Flight Academy, cadets. At ease. We are now racing full-speed toward the 2018 Coruscant Invitational, and that means we're nearly due for some explosive combat. Our patrols are at high alert, and we have to expect that enemy squadrons are too. After all the engagements we've witnessed during the course of the 2018 System Open Series, we expect the battles at the Coruscant Invitational to be fast and furious, and we expect there to be casualties. How can you play your part? That's why we have you here. You have to prove yourself at a System Open Series event to qualify for the Coruscant Invitational, and that means flying like a true ace. Our special sessions of Flight Academy are designed to help you take your game to the next level—one that should help you survive the challenges before you, offer you greater insight into the action you witness during our livestream on Twitch, and might even help you win a berth in next year's Coruscant Invitational. What's the difference between flying a routine patrol and emerging victorious from a dogfight with laser blasts erupting against shields and hull plating in every direction? Skill is part of it. But so is preparation and the right mentality. 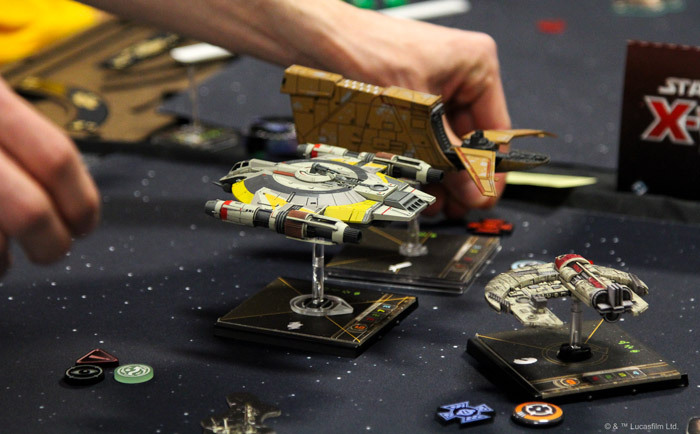 Whether you'll be joining the action at the Fantasy Flight Games Center or following the games on Twitch, it's always good to learn from the aces—to understand how they've risen to the top. Today, we're happy to bring in our guest instructor, last year's Coruscant Invitational Champion, Jeremy Chamblee. 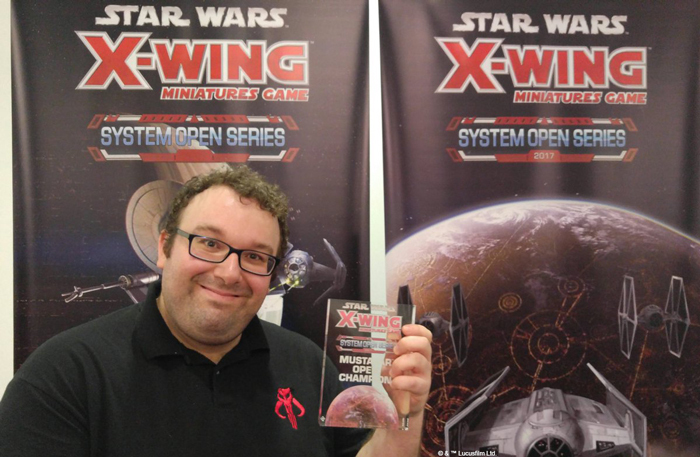 2017 X-Wing Coruscant Invitational Champion Jeremy Chamblee shown with the trophy from his victory at the Mustafar Open. FFG: How did you get started with X-Wing? JC: I've played with miniatures since I was a kid. First with LEGO men battling over the toy box, then on to the big stuff. One day I walked in to my friendly local game store, an army of minis in tow, and I saw some folks surrounding a table with TIE fighters on it. I immediately asked them what they were playing, they said it was a new game called X-Wing, and I asked to play. One game in, and I was hooked. JC: The imagery first. I've always been a fan of Star Wars, and one of my favorite video games was Rogue Squadron on the N64. Tabletop games are my passion, so when someone told me I could play with TIE fighters in a tabletop game I wanted in. Once the childlike wonder faded a bit, the game itself was gripping. Planning maneuvers, strategy, the whole bit. FFG: You mentioned TIE fighters instead of X-wings. Does this mean you're an Imperial player at heart? JC: Yes, I've always enjoyed the aesthetics of Imperial ships. And I do enjoy playing the bad guy. Palpatine is probably my favorite character in Star Wars. FFG: Interesting. I mean, you don't root for him, do you? How is he your favorite? JC: No, he's pretty clearly the villain here. But I enjoy the character for the conflict he creates in Luke and Vader. The throne room scene is my favorite part of any Star Wars film. 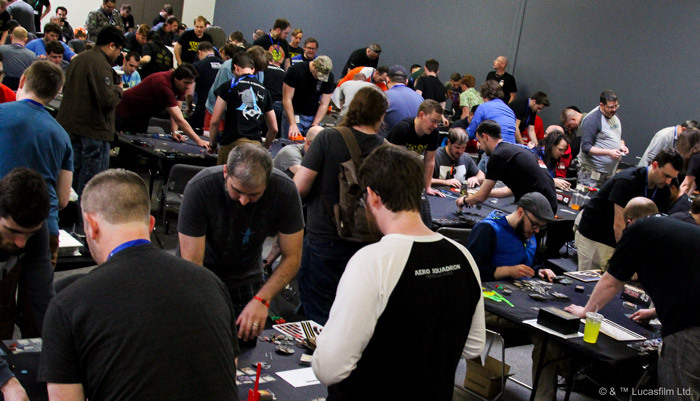 FFG: What sort of tournament experience did you have prior to the 2017 System Open Series? JC: I had played in lots of local tournaments, though I had never gone much further than Austin to do so. I had attended Regionals in Dallas for the past four years. No premier level events, though. FFG: How confident did you feel going into the 2017 Mustafar Open, where you qualified for the Coruscant Invitational? JC: Considering Regionals was only a week prior and I had turned in a somewhat disappointing 4-2 performance, I wouldn't say I was too confident. I really was just happy to be there to enjoy a nice X-Wing vacation with my friends. I wasn't really that concerned about the actual games. I approached them the way I approach casual game night at home. FFG: Why do you think things turned out differently, then? Did you change your list? Did you benefit from the added experience? JC: I think it was a combination of changing my list and just being relaxed. At Regionals I played Chiraneau and "Quickdraw," more focused on finishing games quickly than anything else. I switched to Parattanni because I couldn't think of anything else to play that week and had enjoyed it in my testing. The "Parattanni" list was popular throughout much of 2017. It consisted of Fenn Rau, Asajj Ventress, and Manaroo, all with Attanni Mindlink. FFG: Were you more anxious during the Regional tournament? JC: Yes, I definitely wanted it more at Regionals. I had gone four years in a row and only made the cut twice. Each time, I got bounced in the first round! FFG: So you’re saying it's kind of like the mentality they always encourage before big tests: "You can't do much to prepare the night before. You're either prepared, or you're not. Get some sleep so that you're fresh in the morning." That idea? JC: I think so. I felt much more relaxed at Mustafar than at Regionals. FFG: What were some of the tougher moments you faced at Mustafar? JC: Every game had tough moments, even the ones where I had the "better" list. FFG: Did any stick out in which you remember making choices about how you were going to fly through them? JC: My Top 8 game was against my friend Raul, who I drove down with. He had “Whisper,” “Countdown,” and Yorr. I had to get rid of “Whisper” to have a chance, so we got tangled up in it, and I had a decision to make. Asajj is in the corner and can either go for a hard turn or bank with "Whisper" looking right at her. I take the bank to leave my options open and hope for a collision. Raul reveals a Speed 4 Koiogran-turn, which is excellent on a TIE phantom normally, but thanks to Yorr would be no issue. He just barely clipped my base and collided, swinging the game. Had I turned instead, “Whisper” would have ended up behind me with no arcs pointed at her. FFG: Once you qualified for the Coruscant Invitational, you knew you were going to have to fly some wildly different squads. How did you go about preparing yourself for the challenge of flying each faction and having to draft a portion of each of your squadrons? JC: I had no idea what to expect at Coruscant, apart from having to fly very different squads, so my preparation was just flying a little bit of everything as much as I could. Something like knowing the Quadjumper doesn't have a Speed 1 bank maneuver could be very helpful. 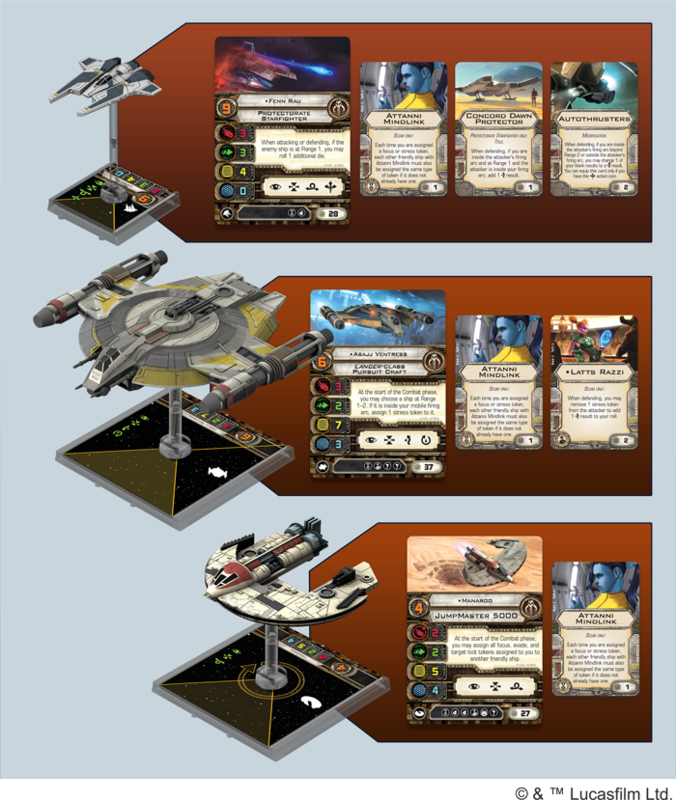 FFG: The format for 2017 Coruscant Invitational required you to bring squadrons of no more than 77 points and then fill out your squadron in a draft. Did you practice all the different 24-point builds you'd be looking to draft? JC: Before the draft picks were revealed, I asked my friends to build me mini-squads to play around with. We erred on the side of janky and oddball squads to make things more interesting. Once all the mini-squads were revealed, I'd build my 77 point squad and before each game I'd roll an eight-sided die to determine which mini squad to add that game. It kept me on my toes and forced me to adapt to a new addition each game. Because I couldn't plan on having any one ship, I built my 77 points to be self-contained and considered the draft ship to be a fun add on. Also, I knew there would be at least one lower pilot skill generic ship in every game, so I skewed towards a slightly higher pilot skill so I could potentially destroy a ship before it could fire back. Oh, the irony… In the finals, my drafted TIE Striker, "Paul Jr.,” was destroyed before he could fire. 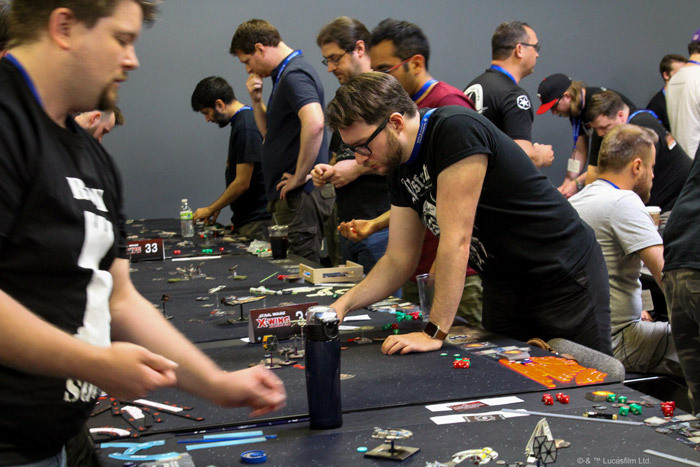 FFG: What moments stand out from your games in the Coruscant invitational? JC: Three of them stand out as pivotal moments in three of my games. First, against William, I had Rexler Brath on one hull against Miranda with three hull as our only remaining ships. Rexler was facing away from Miranda, hiding behind an asteroid as he prepared to K-turn. Miranda could not turn in to shoot because of asteroids, so she did a Speed 2 bank, then slammed for a Speed 2 hard turn, triggering Advanced SLAM to fire off her seismic torpedo. All William had to do was roll a hit, and it was over for me and Rexler. But the dice did not favor him, I survived to K-turn and finish off Miranda. Second was against Jesus. Miranda again, actually. Miranda was his key to winning that game, as Fenn Rau is generally my key to winning. I focused exclusively on Miranda, bringing down her shields. She moved, then slammed to drop bombs right in front of Fenn Rau, who, in turn, collided with her to avoid them. Miranda was near an asteroid and I had my drafted Quadjumper prepared to tug her onto it. I flew up and was millimeters short! Instead, I opted to focus, figuring he would not move Miranda so he could bomb Fenn Rau. He did, dealing two damage with a Sabine-boosted Conner Net. Fenn Rau then tried his best to navigate the Cluster Mines, only barely clipping one. I rolled two crits and Fenn Rau was gone in one turn. I thought it was over. Then I remembered my Quadjumper at Range 1 of Miranda who had three hull left. Three focus results later, and she's gone as well. Last, but not least, in the final game with Zach, I got the dream result with Rexler Brath versus a Bandit Squadron Pilot. My three hits landed with no evades, and using Rexler's ability I got the facedown damage card converted to a Direct Hit! It was the Imperial dream. Sadly, there were no pivotal moments in my game with Mishary. He just slapped me around. I think he's pretty good at X-Wing. FFG: I know you were at the 2017 World Championships not long after the Coruscant Invitational. What can you tell me about that competition? How did it compare to the Mustafar Open and the Coruscant Invitational? JC: The competition is stiff. It was my first Worlds, so I wasn't sure what to expect. But the one thing I noticed more than anything was how well prepared and how sharp everyone was. Even when I was going up and down in the middle tables, players were playing very deliberately, not making a lot of mistakes, and punishing me severely for mistakes I made. FFG: You say the competition was stiff. Were the games like stand-offs, or what was your sense of the community? JC: The community was great! I had a blast meeting lots of new people or putting faces to names. All the players I got games with were very friendly and fun to be around. 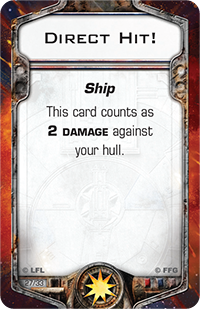 FFG: Okay, final question. What advice would you offer anyone looking to raise their game to the next level? JC: I think the best advice I can give to a player looking to improve their game is to simply play a lot. Play more games with more ships to just learn how things move, how they fight, and how they work together. Try out successful lists or ones that give you a hard time. The easiest way to learn how to beat something is to fly it. Then you'll know how it loses. Talk your games out with your opponent or other players. They might see things you don't and vice versa. Draw experience from as many sources as you can. I would recommend variety early and focus later on. Knowing the various ships' capabilities can help determine what you want to play, what fits with your play style, and can help just knowing your potential foes' capabilities. Once you find what works for you, get comfortable with it. Refine it, practice against as much as you can. It's often more important to just not make mistakes than always make the perfect plays. FFG: All right, that's all I've got. Anything you want to add? JC: Just one thing. My absolute favorite part of the tournament experience—be it for a summer kit or Worlds or the Invitational—is the community. Interacting with other players, seeing old friends, making new ones—that is the best part of going to events like these. At Worlds, I got to see five of my fellow System Open Champions, and it was great to spend more time catching up with them, encouraging each other in our games, and congratulating or commiserating after it was all said and done. We're lucky to have such an open and inviting community filled with really great people to not just game with, but to simply be around. If anyone hasn't gotten the chance or taken the opportunity to go to an X-Wing tournament and meet these great folks, I would highly recommend it.